Kim Stanley Robinson's latest, AURORA, has been out for two months now. This video is a great introduction to Aurora. Stan explains the concept and motivation for the novel, and his talking is complete by animation. This is a good piece of promotional material by Orbit Books, similar to their illustration on how to build a terrarium from 2312! The entire first chapter of Aurora, "Starship Girl", is available to read at Orbit Books. More than just human DNA inside the human body, the fuel problem for acceleration/deceleration, the non-realism of the staple of faster-than-light travem in most science fiction, the complexity of maintaining a functioning society in a confined space, the way humans and all living creatures we know evolved and are tailored for life on Earth, on the development of artificial intelligence, these are some of the issues tackled in the interviews discussing Aurora. Beware of spoilers! 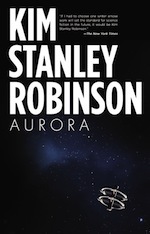 Aurora, moreso than your typical KSR novel, has twists and turns and page-turner developments as the Aurora mission unfolds. Here is an interview for Science Friday radio, on interstellar travel, on Earth as our spaceship -- "There is no Planet B" -- on managing climate change, on who the narrator for Aurora is, plus a reading of an excerpt. A short interview at Capital Public Radio, where Stan talks about how Aurora was constructed but also reminisces on his 40 year career as a science fiction writer. In another Aurora interview for The Guardian, for the Books Podcast, Robinson's exploration of time and space are juxtaposed with psychologist Sheldon Solomon's exploration of death. It's interesting to hear him out on future history and the existential underpinnings of thinking about the future of humanity, of having objectives beyond the length of our lifetimes and how we have to cope with our own mortality with the new knowledge that science has brought to us on our size and place in the cosmos. It includes the reading of a passage of Aurora, and a discussion of forms of politics "passengers" might adopt in the context of a generational starship. Science fiction realism versus fantasy is at the center of this other interview for The Guardian, along with writers Alastair Reynolds and Ann Leckie. The spacefarers in his latest novel, Aurora, set out on a voyage to a star 11.9 light years away with no warp drives, no sentient robots and no nanomachines. The ship’s technology offers impressive upgrades on familiar 21st-century models, from “printers” that can manufacture anything the travellers require, to aquantum computer so sophisticated it wonders if it should award itself the pronoun “I”. But Robinson’s mission launches in 2545, putting his characters as far away from the world of Taylor Swift and the Apple smartwatch as we are from Niccolò Machiavelli and the matchlock musket. It’s almost as if Thomas More had imagined a captain setting out for the moon in a clipper. Robinson makes no apology for the 21st-century tech of his 26th-century explorers, arguing that progress in science and technology will asymptotically approach “limits we can’t get past”. “‘Science’ implies the world of fact and what we all agree on seems to be true in the natural world. ‘Fiction’ implies values and meanings, the stories we tell to make sense of things.” David Hume argued that it’s impossible to argue from the way the world is to the way the world ought to be, Robinson continues, “and yet here is a genre that claims to be a kind of ‘fact-values’ reconciliation, a bridge between the two”. My working principle was, what would it really be like? So no hyperspace, no warp drive, no magical thing about what isn’t really going to happen to get us there. That means sub-lightyear speeds. So I postulated that we could get spaceships going to about one-tenth the speed of light, which is extraordinarily fast. [...] The physics of this is a huge problem. SP: As you were imagining this voyage, which part was most interesting to you? Was it the science–trying to figure out technically how we could get there? Or was it the personal dynamics of how people would get along when they’re trapped in space for so long? KSR: I think it would be the latter. I’m an English major. The wing of science fiction that’s discussed this idea has been the physics guys, the hard SF guys. They’ve been concerned with propulsion, navigation, with slowing down, with all the things you would use physics to comprehend. But I’ve been thinking about the problem ecologically, sociologically, psychologically. These elements haven’t been fully explored and you get a new story when you explore them. It’s a rather awful story, which leads to some peculiar narrative choices. [...] Because they’re trapped and the spaceship is a trillion times smaller than Earth’s surface. Even though it’s big, it’s small. And we didn’t evolve to live in one of these things. It’s like you spend your whole life in a Motel Six. SP: You also wrote a whole series of books about Mars. You still have to get there. KSR: But there’s an important distinction. You can get to Mars in a year’s travel and then live there your whole life. And you’re on a planet, which has gravity and landscape. You can terraform it. It’s like a gardening project or building a cathedral. I think terraforming Mars is viable. Going to the stars, however, is completely different because you would be traveling in a spaceship for several generations where you’re in a room, not on a planet. It’s been such a techie thing in science fiction. But people haven’t de-stranded those two ideas. They said, “Well, if we can go to Mars, we can go to Tau Ceti.” It doesn’t follow. It’s not the same kind of effort. [...] I think Earth is the one and only crucial place for humanity. It will always be our only home. SP: Does the future of AI and technology more generally excite you? KSR: Yes, AI in particular. I used to scoff at it. I’m a recent convert to the idea that AI computing is interesting. Mainly, it’s just an adding machine that can go really, really fast. There are no internal states. They’re not thinking. However, quantum computers push it to a new level. It isn’t clear yet that we can actually make quantum computers, so this is the speculative part. It might be science fiction that completely falls apart. KSR: Dystopias express our fears and utopias express our hopes. Fear is a very intense and dramatic emotion. Hope is more fragile, but it’s very stubborn and persistent. And let's leave it at that for the time being! Gary K Wolfe for Locus: "Robinson is among the premier literary figures in modern SF"
Alan Cheuse for NPR: "near-perfect marriage of the technical and the psychological"
Adam Roberts for The Guardian: "Aurora is a magnificent piece of writing, certainly Robinson’s best novel since his mighty Mars trilogy, perhaps his best ever." Niall Alexander for Tor.com: "its depiction of the ascent of artificial intelligence must be among the most momentous takes on the topic science fiction has ever seen"
I Have monitorred all of Nasa,Jpl etc. since 8 yrs old, being 62 , I'm scared for reading , Blue. I watched again NASA moon landings and was intrigued by the sudden shadow the moon gave on approaoch,, ooh, imagine, 3 days Sun , and then. I Love your Writing Kim, .. off subject.., "Alien Interview"? , worth it or not. I thought OK? a shot??. Are you familiar with airline Cpt. Cathie? Kim, I'm no nut.. , age 9 in New Zealand , I saw with my Gr,Dad, a UFO. For a minute we both watched .. I Digress.. Soo much to ask, Much more Questions. May I Please keep in touch ? Just finished Aurora and I think it's going to stick with me for a while, as 2312 did. I can think of few texts of which I've found the writing so inspiring, but the content so profoundly depressing. Thanks, Kim, for so conclusively dumping on our dreams of an interstellar future. It's hard to accept but thoroughly necessary.